Filmed over five days, this film reveals the complex, time-consuming processes involved in creating a Windsor chair, made by Jim Steele in his Warwickshire workshop. A beautifully simple object, it is in fact anything but. Filmed over five days, the film reveals the complex, time-consuming processes involved in creating the chair, made by Jim Steele in his Warwickshire workshop. This traditional design features woods chosen for their different qualities - ash, elm and hard-to-source yew. 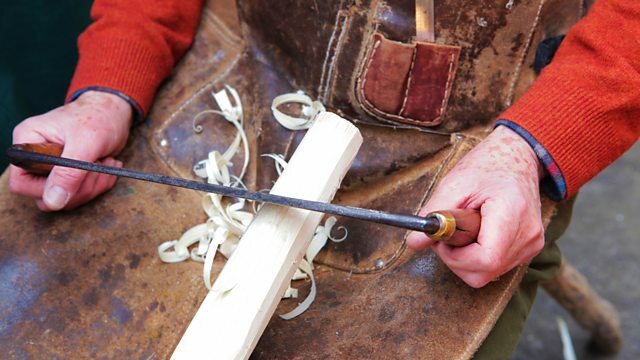 Jim makes just 12 such chairs each year, using traditional techniques and aided by few modern tools. There are just two screws in the finished chair. From the steam bending of the back to the turning of spindles, the carving of the seat to the planing of the arms, it's a remarkable process to observe. The bold style of the film, making use of long, static shots with no music or commentary allows the viewer to admire in exquisite detail the painstaking craftsmanship. Why is the design of a Windsor chair such a challenge? The ergonomic design of the Windsor is a welcome challenge to chairmaker Jim Steele. What’s the secret to steam-bending wood? Series filmed without voiceover or music so the focus is entirely on the craft process. Slow down the pace, sit back, relax and enjoy. Take a quiet, unhurried look at the philosophy of each master craftsman.